There has been lots of positive activity in the British Taekwondo Para-Poomsae Department. On March the 10th the Para-Poomsae coaches: Russell Watkinson, Terry Cooper and Gemma Biescas had a very productive meeting with Tracey McCillen who is the Chief Executive at UK Sports Association for People with a Learning Disability and chair of the Nominations Committee for INAS. This was extremely informative and helped get a clear classification structure for P20 Poomsae athletes in the UK. 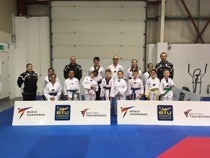 Also in March British Taekwondo held two open sessions to scout for Para Talent ID one in Ickenham and the 2nd one at Quest TKD Centre in Barnsley. It was an excellent turn-out at both the venues and was good to seen new clubs and potential new competitors attend. Although we have had small Para-Poomsae teams competing in the past until now there has never been an Official British Taekwondo Para-Poomsae Squad. Following on from the 2017 success of the Para-Poomsae athletes there is now a squad selection criteria and an elite athlete pathway. At present, there are only two World Taekwondo Classification divisions P20 Intellectual Impairment and P30 Physical Impairment. The GB coaches are aiming to increase numbers and get the GB Classification divisions into the major championships, which include visual impairment, limb deficiency, hearing impairment, a wheelchair user and short stature. As with all disciplines, the National squad aims to be high performance based and looking for Competitive International levels, so a minimal standard is required. Over 20 athletes from the various divisions were invited to join the GB Squad and those that did not get selected at this time were advised to continue training at club and domestic competition level. Saturday 14th April was the first Para-Poomsae National Squad Training Session – the day was split into three separate groups based on impairments, and then each of these groups was further split into three groups of 1-3 players and rotated between the all the Para Coaches. The training was high intensity, and each player received individual training feedback and notes to work on for the next session and to prepare for the GB International in July. 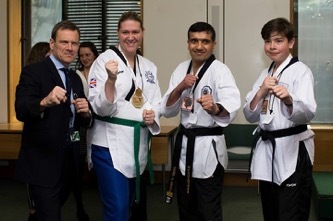 On Wednesday 18th April 2018 three members of the Great Britain Para-Poomsae P20 Squad were invited by Mencap to Parliament to do a demonstration and meet some members of Parliament. The meeting was an All Party Parliamentary Group on Learning Disability (APPG) and was chaired by the Rt. Hon Mark Harper MP with Kate Green MP and Baroness Hollins as Vice Chairs. The meeting discussed the opportunities for P20 athletes to compete at Elite levels. The athletes: Megan Clements from Aquila (P20 U30 Female European Gold Medallist), Rajinder Chatha from LTA (P20 +31 World Bronze & European Silver Medallist), & Bradley Brockies from Yong Gi (P20 Junior World & European Gold Medallist) showed off their 2017 medals. 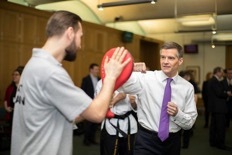 Each player spoke about their Taekwondo journey and accomplishments; they also performed individually and also helped encourage a taster session for the Members of Parliament to have a go at Taekwondo. This was a fantastic experience, and many of the new squad members will be performing in another demonstration opportunity at the Birmingham NEC next week.